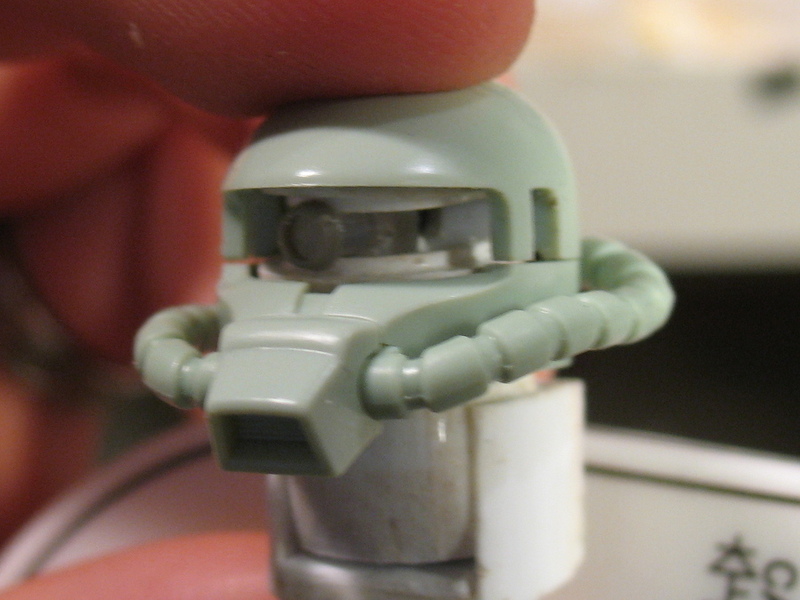 It always bugs me when kits I’m working on have poor details, and Zaku kits always seem to have a couple major issues along those lines: the kit-supplied hands are usually crap, and the monoeye is usually embarassingly simplistic even on the best kits. The monoeye thing is a real problem, because the eye is part of the machine’s “face” and therefore pretty central to the design overall – so if it’s too plain or too sparse, it produces a bad effect. So most of the time I’ve spent on this project lately has been dedicated to fixing those two issues. The hand thing was a problem with Bandai kits for a very long time. These days we’re starting to get decent kit-supplied hands in certain kits, mainly the HGUC line, but in terms of looks, older HGUC hands and almost any other Bandai kit will have fairly ugly hands. So I’m going with some B-Club resin hands for this. But since those resin hand sets are expensive, I’ve decided to make molds and recast the hands for my own use. 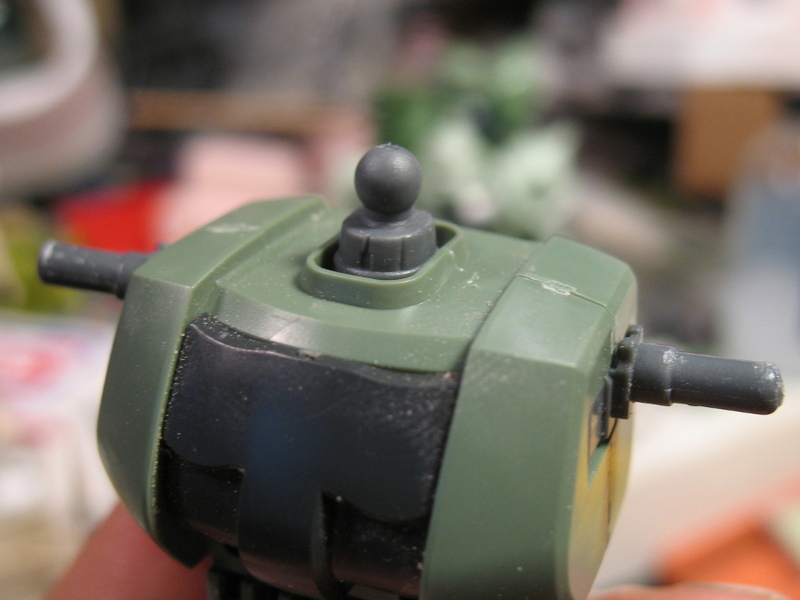 On the HGUC Zaku I removed the wrist ball-joints (it always looks kind of crap, having that empty space where the hand meets the arm and just a little peg holding the hand on) and I’m installing spherical hinges at the base of the hands instead. This will make the mobility of the wrist better in some ways but worse in others – but more importantly it’ll make the wrist joint look a bit more structurally sound. 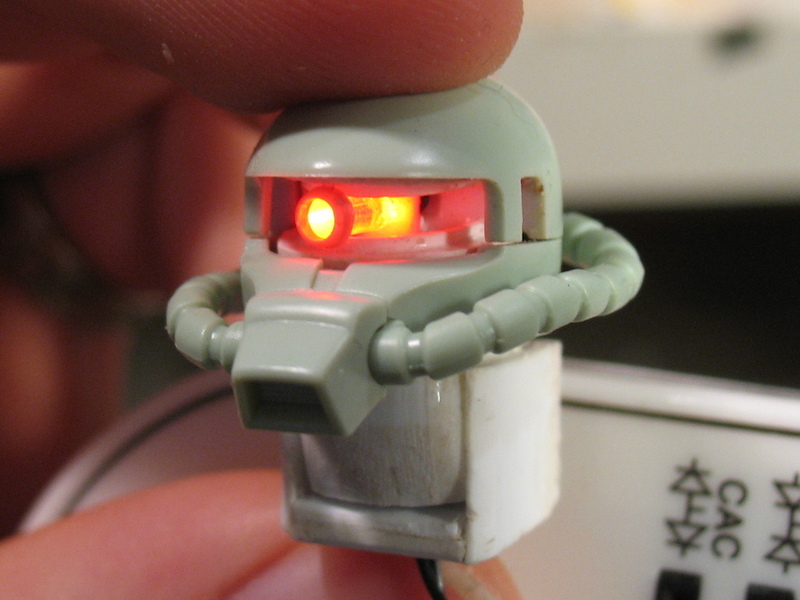 There’s all kinds of ways monoeyes go wrong in Gundam kits: some kits, like this one, just have a flat surface where the monoeye visor should be. 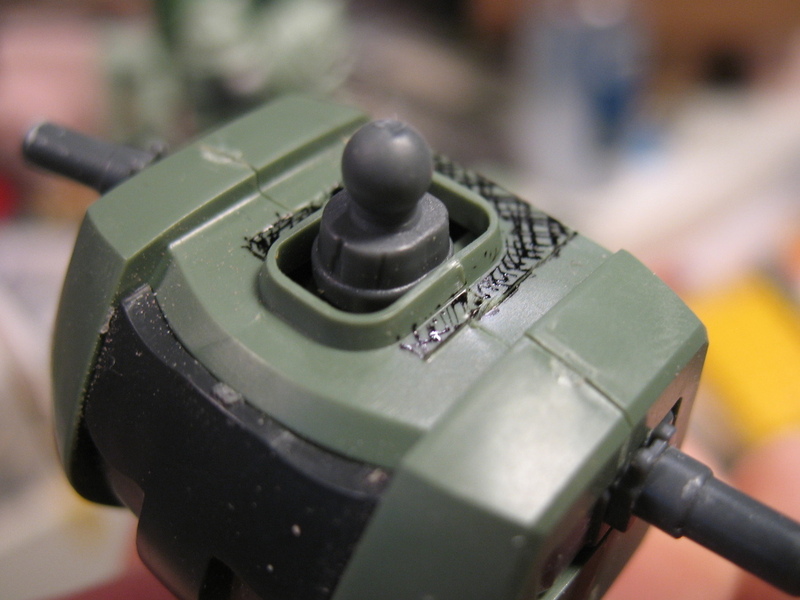 Some, like the PG Zaku, put a clear window in front of the monoeye, but fail completely to make the space around the monoeye look like a space filled with moving parts and sophisticated sensor gear. And when the kits do provide a clear lens for the monoeye, it’s usually some clunky thing without any refined detail at all. One of the things I want to do in my projects is establish some better standards for these eye parts: detail, mobility, and lights where it’s appropriate. The monoeye track and the neck mod parts were all left over from previous projects. 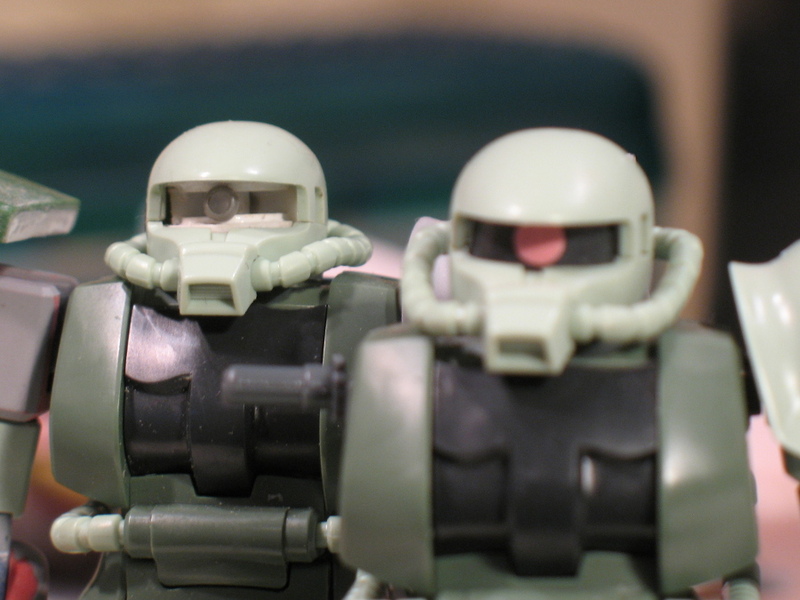 Initially I built them as part of an upgrade of my previous HGUC Zaku, then I had been planning to use them on the FG Char’s Zaku. 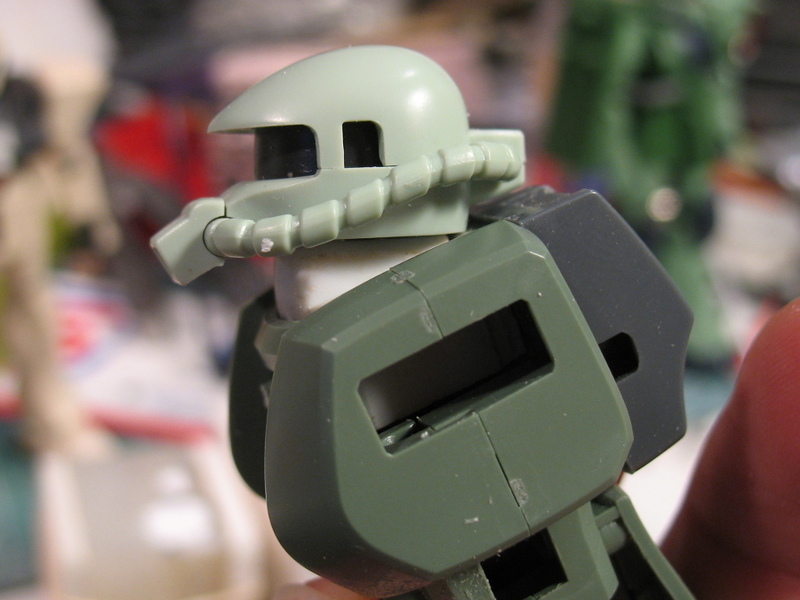 The neck mod wasn’t something I’d particularly wanted for its own sake, except that due to the way the eye mod worked, it wound up taking space in the head that previously had been used for the neck joint, so I had to come up with a new neck joint. That being the case, I felt I might as well make it a good one. 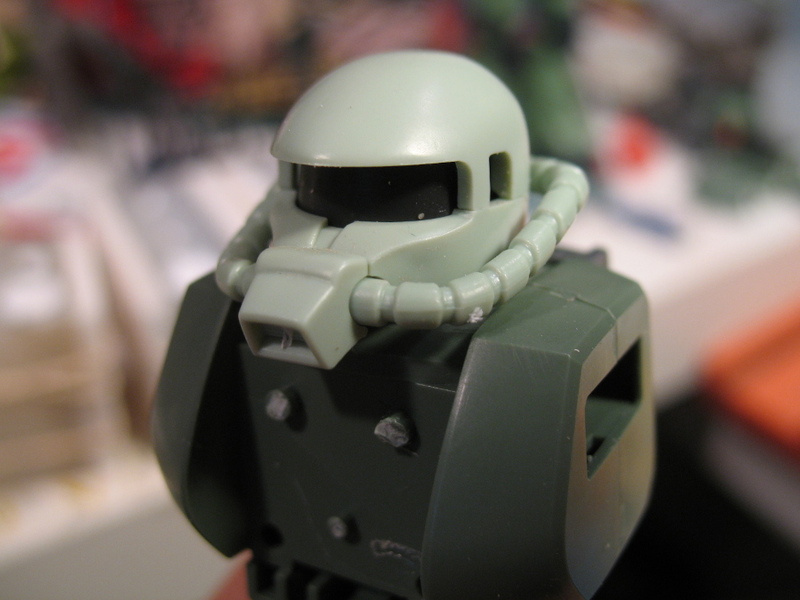 I’ve also considered the possibility of having the whole neck joint be removable from the torso, as a way to access an internally-stored battery for replacement. The eye assembly that’s mounted in the head is made up of three main parts: The eye itself is mounted on a 3mm rod that runs vertically through the eye assembly to allow rotation. Into the side of this 3mm rod I drilled a 2mm hole. I put a surface-mount LED in the hole and then glued in a piece of clear 2mm diameter rod to act as a light guide from the LED to the actual eye itself. At the end of the rod I stuck on a little round-mold thing to suggest some framework around the lens. The rod is clear now but ultimately it’ll be painted, so that light will only come out at the end. 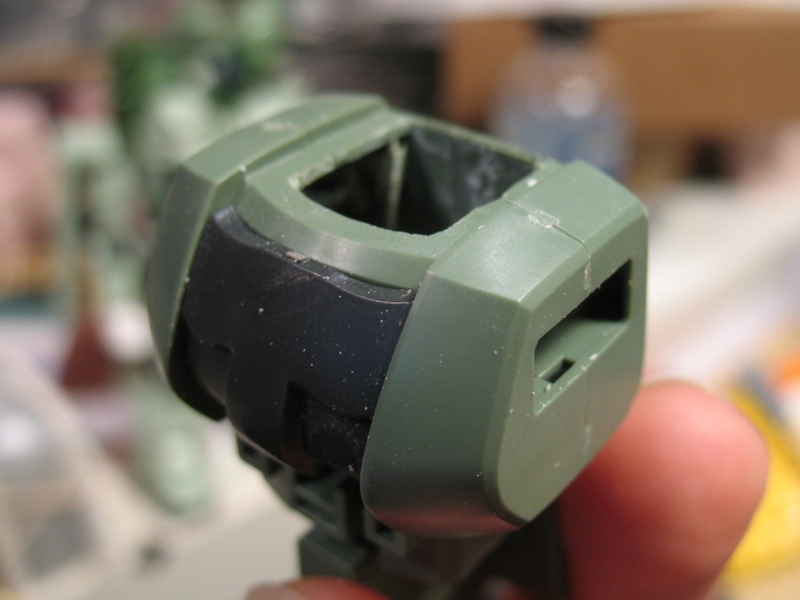 Around the eye part, the “head internals” assembly is made up of two plates, shaped to fit inside the HGUC Zaku head. 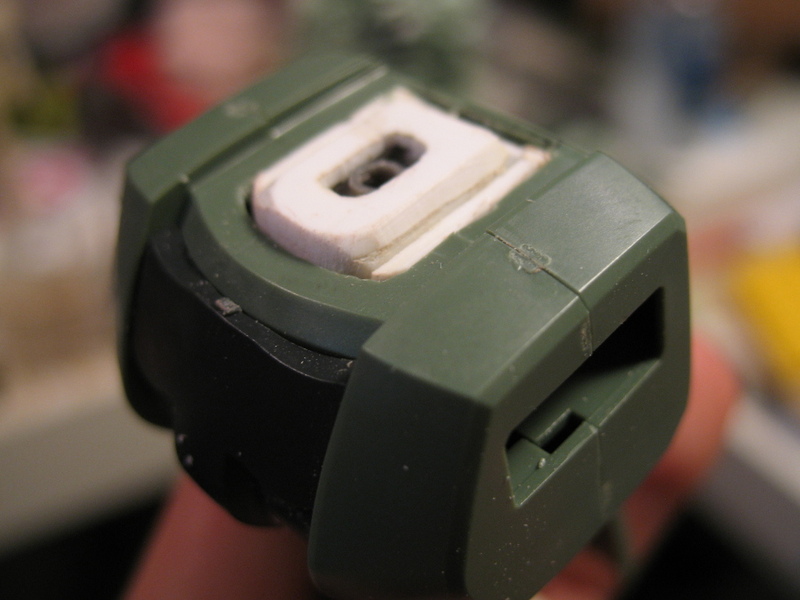 Each plate has a piece of styrene strip glued on to act as the “monoeye rail” – in the anime, monoeyes slide along these rails… For the purpose of my model it’s sufficient that the rails make the space around the eye look less vacant. The bottom plate includes a spacer with pins, which makes it easy to stick the two plates together at the right spacing and see how the finished assembly will look. The bottom plate also includes a 2mm rod which extends downward to connect with the neck joint. 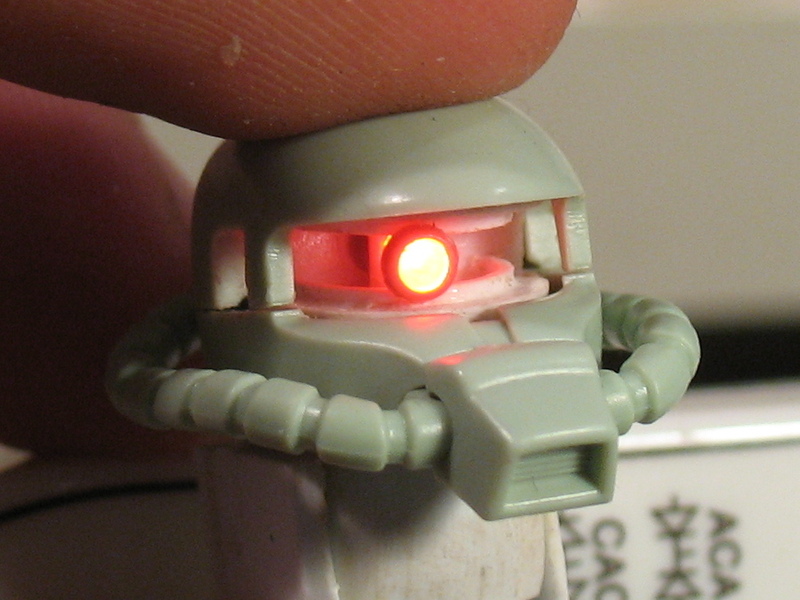 I was wondering how to make a mono eye in my HGUC Zaku 1 … and here you are with an SMD LED. The monoeye on this build is mounted on a rotating cylinder that fills the visor space – so it would be possible to take a similar approach and use another LED like a 3mm LED or a 2mm axial, and simplify things a bit. But I tend to prefer having a separate lens and housing, rather than just have the LED be the monoeye. I don’t like having the LED dictate the color and shape of the lens. It’s been a little while since this project – but as I recall one of the big problems I had casting the hands was getting the mold halves properly aligned. B-Club didn’t necessarily get that right in the first place, which produces kind of a nasty mold line on the sides of some fingers, and so I had to fix that up and then recasting tends to make it a little bit worse. 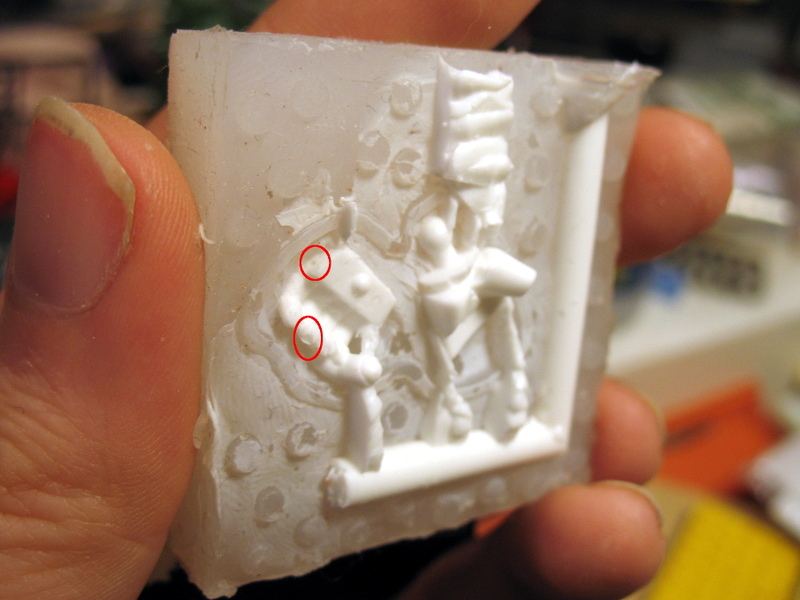 And I do tend to get air bubbles in castings like these, which can ruin a casting pretty quick as a bubble can wind up occupying an entire knuckle or something. I don’t have a vacuum chamber (really should fix that) but I do pressure casting. Bubbles aren’t drawn out but instead compressed. It actually works pretty well, though with my old compressor it was hard to get the necessary pressure quickly. But in the end I did cast a set of hands for this build, using the HIPS joints to attach them to the arms. 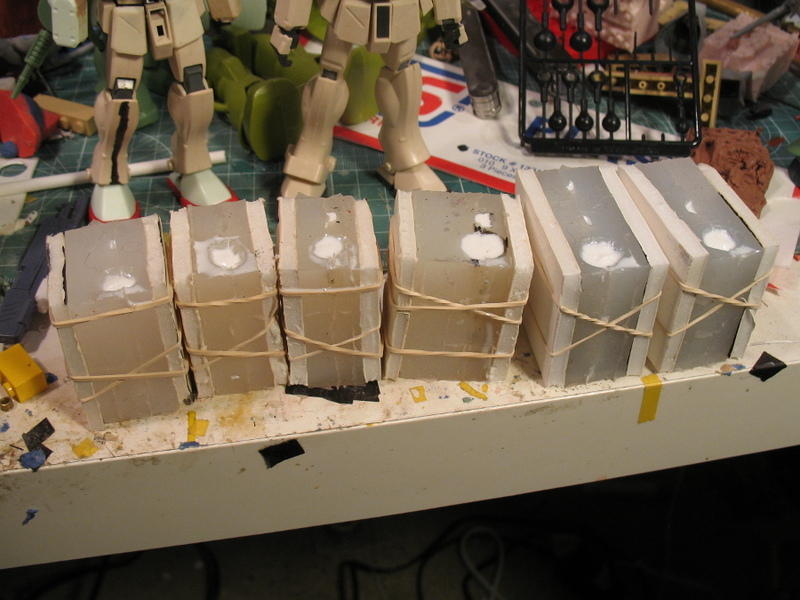 …And I haven’t really done too many more castings from those hand molds since then. The thing is, these hands are sized for the HGUC Zaku and other 1979 styled designs, so they are rather large. There’s not necessarily a whole lot of builds where I’d actually want to use them. 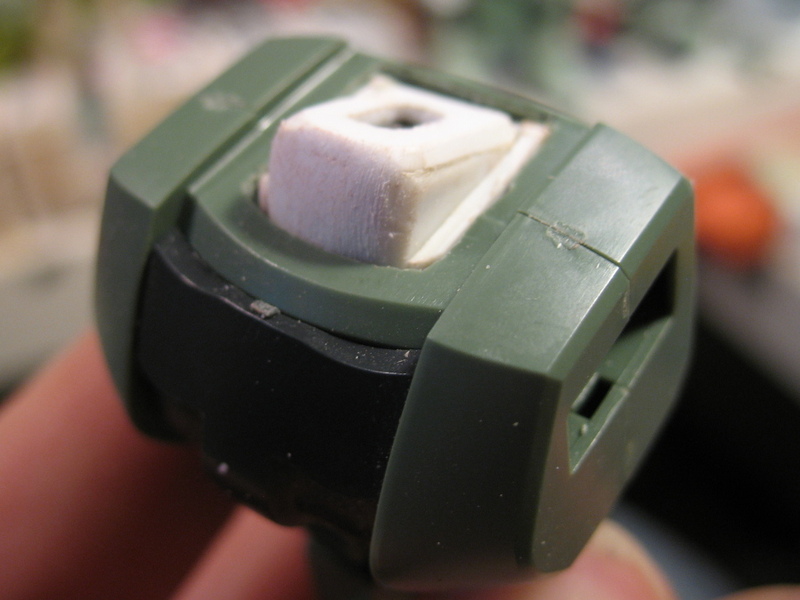 When I did my build of the HGUC Zaku FZ in 2016-2017 I used a different set of B-Club hands – the BCL2000 hands I think, which were designed for the First Grade Zaku. The design of them is basically a mix of the Perfect Grade hands (mainly the design for the plate on the back of the hand) combined with the CCA/0080 Zeon hands for the palms and fingers. Makes them a little bit too chunky for the FZ but they’re very nicely sized, which really helps keep them from overwhelming the fairly petite forearms of the HGUC FZ. 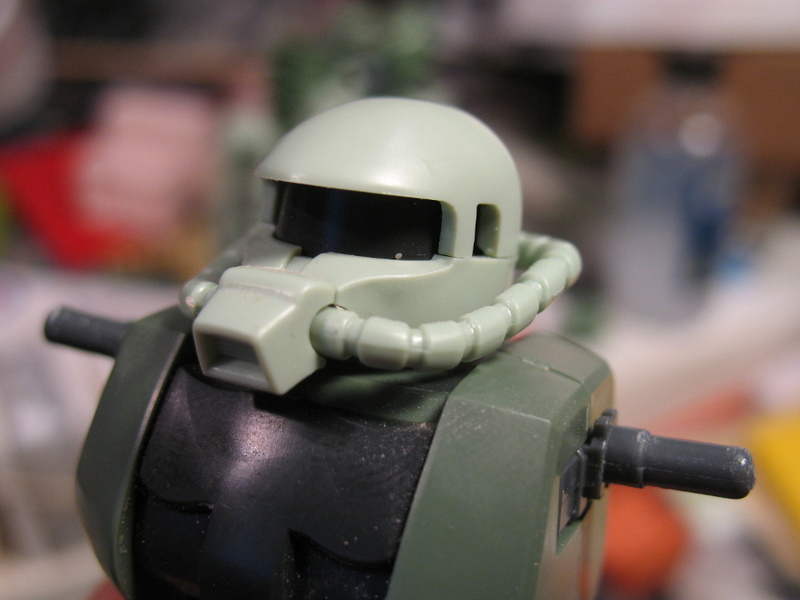 The rest of my posts on this project can provide a bit of detail on how things turned out: This project started out as “Fixing the HGUC Zaku” (because I altered the legs and fixed up sore spots like the cables, monoeye, and hands) and turned into “Zaku 84” (because the project went in a sort of MSV direction stylistically, and those kits came out in 83 and 84 – I tend to identify some of my builds by the numbering I use in the decals) – it’s lumped together with a few other projects under that “144 Zaku Project” tag. 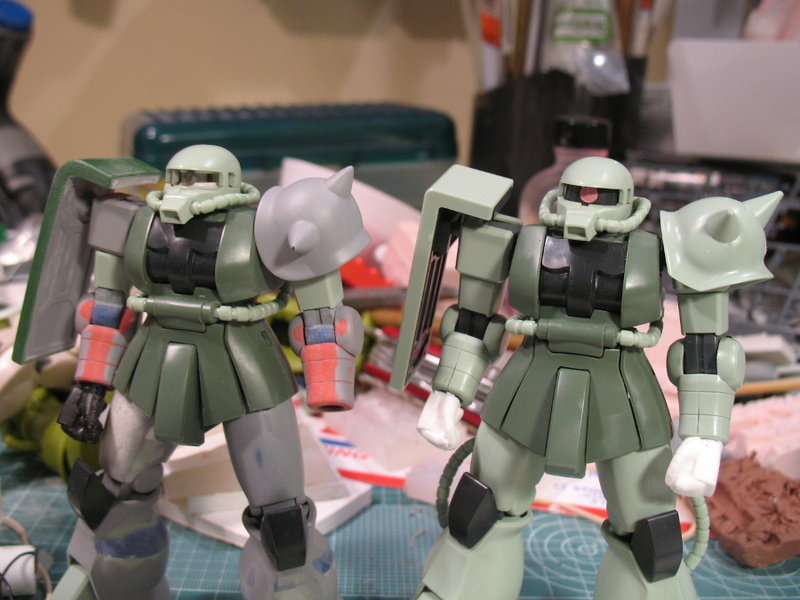 Part 5 gives a pretty good idea of how the hands turned out, and then HGUC Zaku #84 “Completed” (mostly) has the pictures of the finished build, including a few little stop-motion animation tests I did with it.